The pharma landscape is an ever-roiling ocean, with new trends constantly making new waves and tossing the industry onto a new course. Today an industry game-changer is beginning to break the surface and is being used to generate influential comparative evidence. It is the head to head trial – and it is proving to be a powerful mechanism for the testing of competitive medicines. A tactic for those already on the market who are eager to expand their market share, it offers the promise of considerable commercial advantage. Not too long ago, the idea of a head to head trial as a method to differentiate would never have made it past a product’s first tactical planning session before being tossed in the bin. Many therapeutic areas weren’t crowded or competitive enough to warrant such a risky leap for greater market share, and too few examples of successful head to head trials existed to inspire its usage. Now, the picture is different. In saturated, elbow-to-elbow markets full of products jostling for smaller and smaller slices of the market, pharma companies are eager for a maneuver that will grow their share not marginally, but significantly. By directly comparing safety and efficacy, head to head trials serve as an opportunity to separate a product from the others attempting to drown it out, which will only become more and more important as over-saturated markets continue to crowd. When an investigational medicine is directly compared to an existing standard of care, powerful information is released. And as mentioned, this intelligence can be doubly powerful in already saturated, highly competitive markets where marginal growth might not be enough to claim the market share needed for success. A prime example of such a market is the Rheumatoid Arthritis (RA) space. The crowded RA field is particularly representative of larger marketplace trends. Gaping knowledge gaps persist in the relative efficacy and safety characterization of multiple RA drugs. Conventional meta-analytical methods are limited in their ability to compare relative effectiveness. This scenario makes RA a fertile ground for head to head trials, and is applicable to many other markets – meaning, head to head trials could start to be seen more and more in other similarly crowded therapeutic areas. Designed to prove that one drug intervention is superior to another. Sample size is based on a pre-specified minimum clinically important difference. If not proven superior, the drug’s license still remains. If proven superior, the drug gains competitive advantage. Designed to test if the effects of two interventions are the same within pre-specified margins. True equivalence trials require very large numbers of patients and are rarely used. Designed to measure if the effect of one intervention is no worse than an active control intervention. Tend to be used more often than equivalence trials as they better fit research questions of interest and require fewer patients. Are used if superiority cannot be achieved or isn’t anticipated. Deallus is a trademark. All other marks are the property of their respective owners. As you can see, head to head trials are being utilized by pharmaceutical companies vying for a larger market share and hopeful that their product will out-shine its competition. The reasons are obvious. The availability of freshly served head to head data can be a powerful asset to decision-makers, especially those faced with a nebulous pool of evidence on existing medications. Another obvious point? The risks. If a product is taken to a head to head trial or is the one to take a competitor into the arena, and it comes out defined as the less efficacious drug, its road to strong market share just got immeasurably more difficult. A head to head trial holds the potential to break through the noise of conventional randomized placebo-controlled trials and meta-analysis. Physicians and payers can use them to guide their decisions on the best choices for their patients and disbursement. Regulators can factor them into the drug approval process. Pharma can use them to drive sales. In short, head to head trials were built for a crowded market full of products in need of significant differentiation, and this is the exact type of market space we are seeing in more and more therapeutic areas. While head to heads were ignored in the past as a tactic for market share expansion, they cannot be ignored any longer. 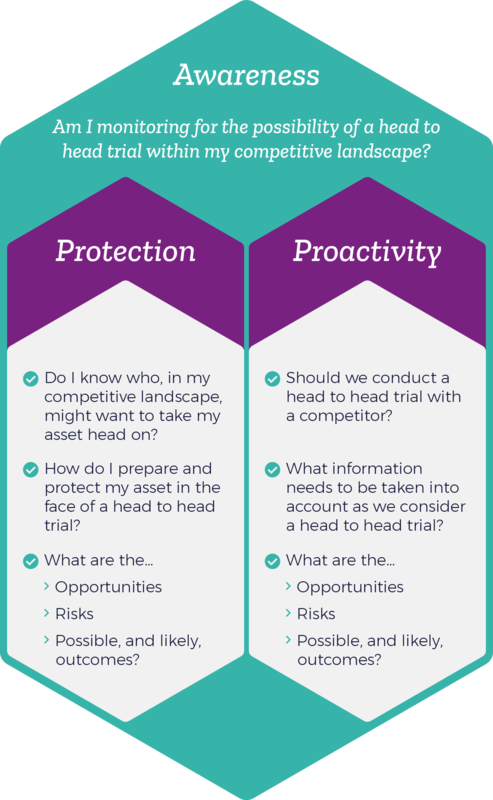 And whether it’s a method you might consider using, or a tool your competitors could bring against you, anyone with a product in a crowded market should be asking how head to head trials might affect an asset’s strategy, market share, and success.